Overseeding your pasture with winter ryegrass is a cost- and time-effective way to ensure that your animals are supplied with nourishment in the early spring (and throughout the winter, in limited fashion) and ensure that you have adequate groundcover when spring rolls around. Overseeding can also help you reclaim areas of a pasture that are now barren due to extensive battles with weeds. Spreading seed this time of year without tilling also helps prevent erosion because your soil remains covered with vegetation. If you can improve your overall pasture production and bolster the existing forage without the time and effort of major tilling or other seed-bed prep, why wouldn’t you? Now is the perfect time to overseed, because you’ll allow plenty of time for the new forage to establish itself before spring is sprung and regular grazing begins. Also, it’s simply easier to get into your pasture in the fall, as opposed to early spring after a winter thaw, when fields are sometimes wet and soggy and hard to access. And while you’re not always likely to develop enough top growth to support much fall grazing, if you overseed with an annual ryegrass (as we recommend), fall conditions typically make for successful germination. Overseeding in the fall means that you benefit from firm, flat ground of the summer pasture, and by not tilling it up, animals are offered better footing for winter grazing. And with careful management of winter grazing, the primary forage in the pasture will quickly bounce back with spring growth. 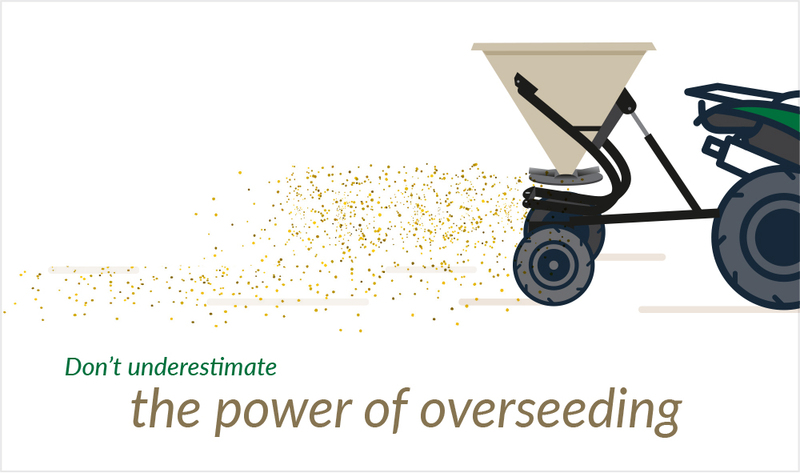 Why should you be overseeding winter ryegrass? Annual ryegrasses like Earlyploid or Prine Tetraploid by Ragan & Massey are vigorous and hardy, meaning that they can easily compete with the existing forage and establish themselves with minimal difficulty. And since it doesn’t require a prepared seedbed, annual ryegrass is perfect for broadcast applications without re-tilling. Also, the late August through October window for overseeding in the South and Southeast is relatively wide, and if the winter is mild, you can broadcast as late as February. All you need to produce a thick stand of annual ryegrass is 20 to 30 pounds of seed per acre. It’s not always required, but some light tilling can help encourage germination. If you’re overseeding into Bermudagrass (popular in the South), you can expect great production from late March through June.